It's only Fevbruary and I've already had it with winter. I am getting sick of all this snow. I really don't mind the cold weather but the snow does start to wear on me after a while. We have already had several major storms and with more in the forecast I can't help thinking of the warm weather. Of course thinking of warm weather often makes me think of summer foods and I started craving some barbecue chicken. It's a good thing I DVR'd an episode from America's Test Kitchen for Oven Barbecue Chicken. I watched and jotted down all the ingredients and instructions which was kind of a pain but I did not have this recipe in my annuals. I am not displaying the recipe in full, but I will give you a run down on how easy it was. 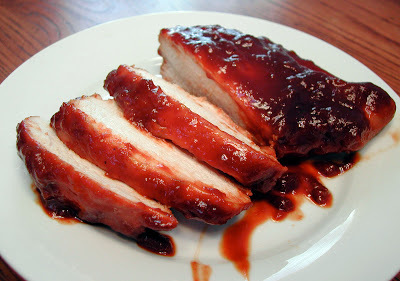 It is a really good recipe which starts with making your own barbecue sauce. They use the usual ingredients: onion, ketchup, apple cider vinegar, molasses, maple syrup, worchestershire sauce, dijon mustard, chili powder and cheyanne. The thing I liked about the recipe is that you can use boneless, skinless chicken breasts. Easy. No butterflying, no pounding, no mess! It's a unique cooking way of cooking the breasts. First you brown them in an oven proof saute pan. Then using the same pan, you add the barbecue sauce and scrape up the brown bits from the browned chicken. This cooks for about 5 minutes, then you return the chicken to the pan and coat with the sauce. Next, the chicken goes into the oven for about 12-15 minutes and then under the broiler for another 12-13 minutes until it reaches 160 degrees. Bring on summer, for sure!! Mmmm Annie this looks dee-lish! I wonder if it is any issue of Cook's Country or Cook's Illustrated? I posted a nummy on my blog with you in mind! I am so sick of winter too! I love Cooks Illustrated! I made these tonight and they were fabulous! I went on the hunt for the recipe and finally found it in May/June 2004 of Cook's Illustrated titled Sweet & Tangy Oven- Barbecued Chicken. I wish I'd had some macaroni salad to go with it though. It was just begging for it! LOL Thank you for posting it. when i bought my house throught costa rica homes for sale i wanted a great kitchen with a big space to put a big oven. Now i can baking every kind of cakes in there.